Alex, a Santa Clara University student, photographed by Samir and Chelsea on #MacysCampusTour , wears a spring floral sweater, gray suede oxfords and a neon yellow backpack. 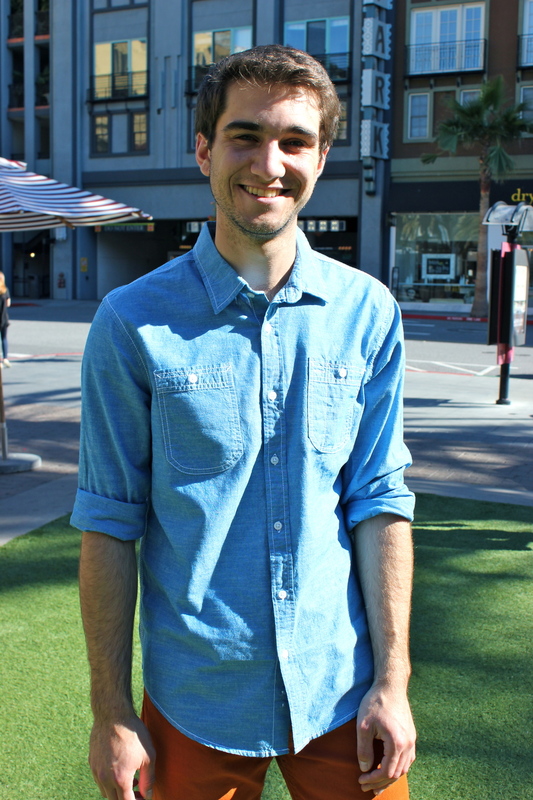 Posted on April 17, 2014 by Campus Sartorialist and filed under CA, Macy's Campus Tour, Men, SCU. 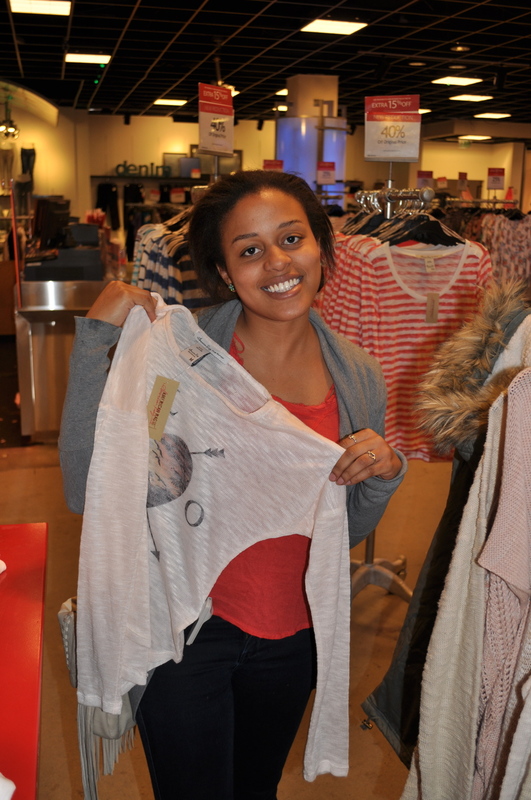 Posted on April 7, 2014 by Campus Sartorialist and filed under CA, Macy's Campus Tour, SCU, Women. With spring rolling around it’s time to break out the lighter fabrics and bright colors. Samir and Chelsea styled Kyle as part of #MacysCampusTour with a cool blue linen shirt from American Rag and an amazing orange pair of jeans from Levi’s. Be sure to keep an eye out for both of these brands next time you’re at Macy’s. Posted on April 4, 2014 by Campus Sartorialist and filed under CA, SCU, Macy's Campus Tour, Men. Happy St. Paddy's Day from Campus Sartorialist and our SCU Campus Sartorialists! Posted on March 17, 2014 by Campus Sartorialist and filed under SCU, Men, CA. As part of #MacysCampusTour we were tasked to create a few outfits for spring that incorporate staple items from the mstyle lab line. We found some great pieces from American Rag that you can see below. Chelsea chose the Royal Navy Kimono to compliment her spring look. Samir wore a faded Aztec print shirt and a royal blue v-neck sweater that complimented Chelsea's outfit. For more looks from check out Macy's Campus Tour, and Campus Sartorialist, and download the new Macy's app for Android and iOS phones for a chance to win a Macy's gift card! 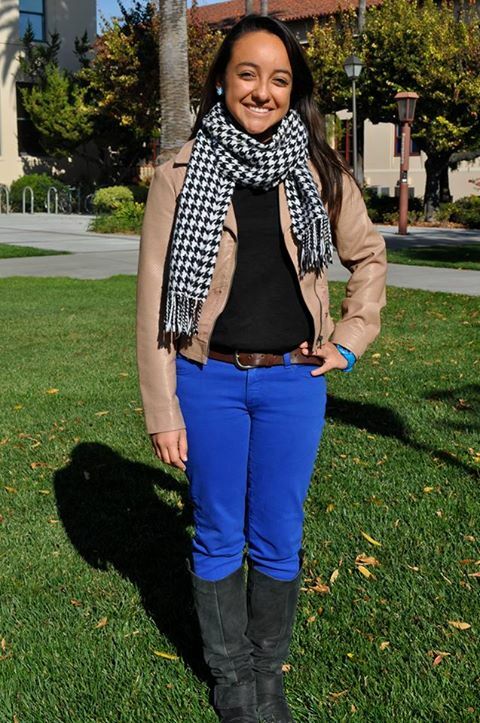 Posted on March 10, 2014 by Campus Sartorialist and filed under CA, SCU, Women, Macy's Campus Tour, ME. Posted on December 10, 2013 by Campus Sartorialist and filed under CA, SCU, Women. Posted on October 21, 2013 by Campus Sartorialist and filed under CA, Men, SCU.